Almond has been grown in India mostly in the hilly areas of Jammu and Kashmir and Himachal Pradesh. Attempts were made to extend its cultivation in the subtropical areas. 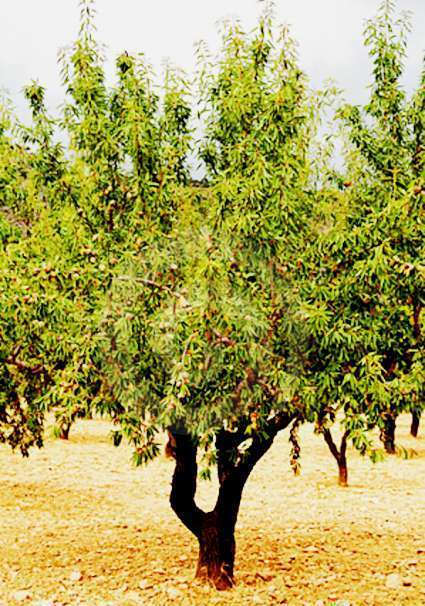 Almond can be grown on different types of deep, well-drained, loamy soils are ideal. Soils with had pan, waterlogging and high water table, should be avoided. 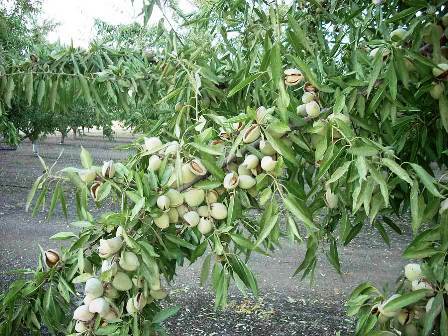 Almond requires a fairly warm dry weather during ripening of the fruit. Col and foggy simmer does not suit it. Dare to early flowering it is very susceptible to spring frosts. Blossoms with petals exposed but not yet opened are known to with stand cold at –2.2`C. 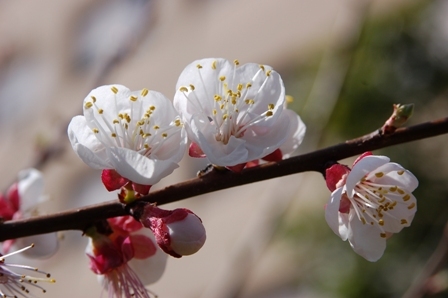 The blossoms can often withstand temperature from –2.2` to -3.3 `C for a short time. It ripens in the last week of June. The thin-shelled nuts are bold, weighing about 2.1 g each and the average yield being 3.8 kg/tree. The thin-shelled variety with bold nuts ripens in the first week of July. On an average, a nut weight 1.7 g, the average yield being 3.7 kg/tree. Thin shelled nuts of this variety are bigger than all other varieties. On an average, a nut weights 2.5g, the average yield being 3.7 kg/tree. Earliest ripening variety, its nuts are harvested in the first week of June. The nuts are semi-hard, small –sized, the average yield being 3.5kg dry nuts/tree. Almond is commercially propagated by budding and grafting. Peach seeds from healthy seedlings are stratified similarly to those of peach propagation. The seedlings become buddable during May-June. The grafting is done from November-January. Almond trees on peach seedling rootstocks grow more vigorously, come into bearing earlier and survive better than on almond stocks. Kabul Green Gangu is also a good dwarfing rootstock for almonds. Almond plants are planted in 1m x 1mx 1m sized pits at a distance of 4.5 m x 4.5m in January in square system. Most of the almond varieties are self-unfruitful. Therefore to plant two or more cross-compatible varieties which flower at the same time in alternate rows are essential. Almond plants are trained according to modified leader system. It bears mostly on spurs which live for five years. Thus in young trees, only diseased, dry wood and the branches which are interfering with each other should be removed. Water sprouts arising on the stem should also be removed as early as possible. In old bearing trees, pruning is done to remove one-fifth of the growth every year. In addition to 10 kg farmyard manure, application of 280 g calcium ammonium nitrate, 220 g superphosthate and 165 g muriate of potash/year age of the tree is optimum. Apply farmyard manure in December and January along with P and K. apply half N in spring before flowering and the remaining a month later. The dose may be made constant at the age of seven years and above. Weekly irrigation from April to September except during rains is recommended. Twice month irrigation in October-November and again in February-March is sufficient. Since most of the almond varieties are self unfruitful, these require more than one variety for fruit set. Honey-bees act as good pollenizers. Almond California Papershell, Pethick’s Wonder, Hybrid 15 and J K 55 can be planted in alternate rows as these can pollinate each other. Almond are ready for harvesting when the hull color changes from green to yellow with the splitting of suture staring from the pedicel-end. In plains, harvesting time is mid-June-July. 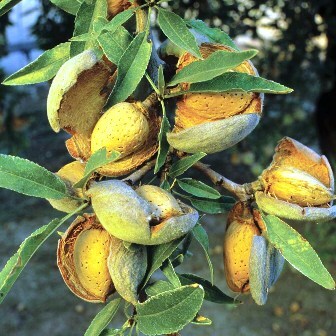 On an average almond provides 2-3 kg dry nuts/ plant.